Editor’s note: The following article was written for an Ebert Fellowship in memory of the late Roger Ebert.The fellowship works with the forthcoming Roger Ebert Center at the College of Media. Chicago Tribune film critic Michael Phillips advises the Ebert fellows. Chaz Ebert and Maltin moderated a Q&A after the film. However, Chaz argued with Maltin’s introduction. The audience and Baker agreed with Chaz sounding off several cheers and a round of applause before the moderators turned their attention to the vivacious composer to talk about her music and process for scoring silent films. Baker’s commitment to her unique sound is integral to what she creates blending a classical music education with modern sensibilities. Entertaining the crowd at this year’s Ebertfest took some logistical determination as well. 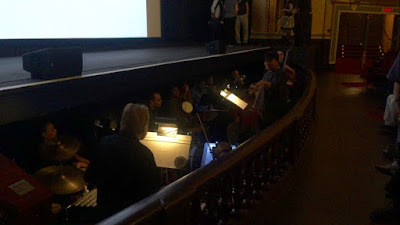 Baker managed to squeeze 16 musicians and vocalists into the Virginia Theatre pit that is made to fit only 10. She needed every single one of those sounds; however, so she made it work – another testament to her commitment and strong personality. She also unabashedly described her desire to start her own orchestra as a narcissistic endeavor. She believes her art stands on its own entertaining a silent film audience via sound while they understand the basic storyline via sight. The two arts succeed in tandem as parallels but not essentially intertwined. There’s separation there that breathes new life into the accompaniment letting the music speak freely on a higher level not simply as a live interpretation of exactly what is shown on screen. However, Baker’s highly animated conducting style does lead her musicians who she hand-selects to join her orchestra. Some, she finds in unconventional ways like Yoseph Henry, whom she discovered in the back corner of a coffee shop when he walked past her humming. At the time, Henry was working for ADT. He now adds the hauntingly beautiful vocals, alongside Saalik Ziyad, for “Body and Soul’s” energetic yet melancholy score. Baker’s composition is written in ink to preserve its original authenticity. It’s pure inspiration for her – a celebration of her style and clear artistic vision. If any musician in her orchestra, or anyone she works with for that matter, has an objection, they can take their leave. And these musicians get that. Baker told me in an interview after her Q&A that conducting a live performance for a silent film is not more complicated than any other instance of conducting – if she is working with the right people. Baker speaks her own unique gestural conducting language where she can make the music sound like it has all been written down in advance. It’s a process she developed while studying non-traditional conducting languages. The assertive composer was also asked in the Q&A about her thoughts on the layered issues presented in “Body and Soul” related to race, religion and abuse of women, among others. But she prefers a purely artistic approach to what she creates choosing to zero in on the music instead of thinking about the issues. For more information on Baker and her impending projects, visit: reneebakercomposer.net or chicagomodernorchestraproject.org.